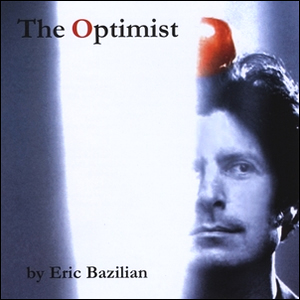 The Optimist is the debut solo album by Eric Bazilian, released in 2000. It is kind of odd to consider that this artist’s “debut” anything would come at the dawn of his fourth decade of professionally performing, writing, recording, and producing. But all of the previous recordings by Bazilian were done for acts such as Cyndi Lauper, Joan Osbourne, and of course, his primary band The Hooters. But at this point in time, that band was smack dab in the middle of a 14-year period between studio albums, with Out Of Body being released in 1993 and Time Stand Still not coming until 2007. The Optimist is a pleasing assortment of well-crafted rock songs released on the indy Mousetrap Records label. It is clear that Bazilian’s songwriting is cut from the Lennon/McCartney cloth, but he masterfully adds many of the sonic developments in the thirty years since the Beatles breakup, right up to including some drum loops by Gota Yashiki, “The Groove Activator” who played a big part in forging the rhythm on Alanis Morissette’s Jagged Little Pill. The album is a hybrid of demo tapes dating back to 1996, many self-composed and recorded parts, and some professional mastering. Bazilian was spending his summers in Sweden with his wife’s family and recorded some of the album in his in-law’s barn on his Macintosh laptop. The album begins with “Driving In England”, an almost-punk-like composition with an infectious drive that makes an excellent beginning to the album. The song, which was co-written by guitarist Randy Cantor, contain vocals with much grit and an air of desperation and drums by fellow-Hooter Dave Uosikkinen. Cantor also co-wrote “Gemini Yo Yo”, with another drum-fused rhythm, distant fuzz guitar, and a half-serious/half-pureness element reminiscent of Cheap Trick. A more melodramatic, piano-led version of “Until You Dare” was recorded by for the Hooters’ Time Stand Still album in 2007. Much of the rest of the album is a fusion of the millennial sound along with some entertaining infusion of diverse instrumentation and styles. “Bye Bye Baby”, co-written by Glenn Goss contains a saxophone driven riff with vocals that perfectly mix Tom Petty and Bob Dylan, and just a touch of Lenny Kravitz added to the blend during the choruses. It also contains a nice coda crescendo to top off the vice. The pure pop song “U.G.L.Y.” dated back to sessions in 1996 with the finished product co-written with Amanda Marshall in 1998, while the fun “Kid from Outer Space” contains some crisp, layered, and entertaining guitars and exceptional bass – all recorded by Bazilian. “Fiddlesticks” is the type of song which could have been a big hit in different era, while the closing title song, “The Optimist” is a deeply philosophical tune written and recorded in the barn in Sweden. The CD also includes a hidden bonus track, the original 1995 demo of “One of Us” which Bazilian presented to Joan Osbourne in the studio before the song would go on to international fame and acclamation. Aside from the “Until You Dare” inclusion, It seems like many of the same themes about time and life are continued on the Hooters next effort, Time Stand Still in 2007. Still, there is something about hearing this artist completely liberated, without consideration for input or opinion from band members, that makes it a more pure and honest effort.